Modern Beauty Girl: Spring Makeup Inspo! So spring is in full bloom and I wanted to do a few makeup inspiration posts for you guys! Today's post is on makeup, but the next two posts will be nail and hair inspo! Let's get started. I love the bright pop of blue! I know the girl in the picture has blue eyes and it looks fab, but I think that it would really make hazel eyes or brown eyes pop! I think it would also look really cool with green instead of blue and gray instead of brown! I love how metallic this look is! It is just so dramatic and pretty and I love how the metallic shadow circles the eye and how the upper lid matches the lower lashline. This looks like such a great going out look! 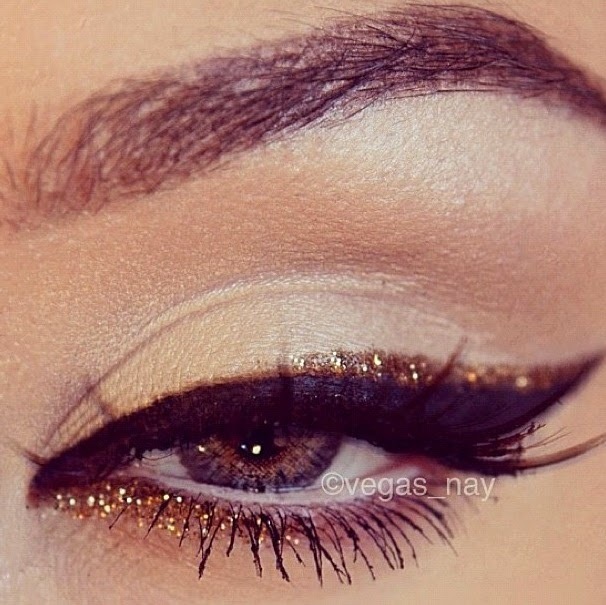 Love the glitter on this! I think that the way the lower lashline and upper lashline is lined is really unique because when the eye is closed, it looks like one continuous line! I really want to try this out soon. So all of these pictures were taken from pintrest and I love them all! Let me know what you think of these looks in the comments below and come back tomorrow for the hair post!